Here you will find personal stories (blogs) about my journey with gastroparesis that you will not find on the other site. However, you can shop our “GP Fight Store” directly there. Check them both out and see which one you prefer! 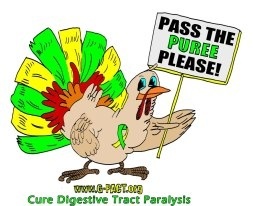 I was diagnosed with Gastroparesis in the Spring of 2012. Yet I suffered for many years prior. It is my vow to advocate for all of us GPer’s to ensure a better quality of life for all. I will need your help in the process, so check out the opportunities tab and watch for more information in future blogs. Around the Fall of 2012 I became a G-PACT volunteer and helped set up the “Pass The Puree” fundraiser for Thanksgiving. My mother and myself made up Thank You Cards (home made) to be sent to those who made donations. When the colors were approved, shirts were made. I do need to point out that the turkey image was created by another team member. It was a great event! I also help out on a few web-sites as an Admin for others that also work hard to advocate for gastroparesis, such as Emily’ Stomach. HERE is a link to her new Facebook Page and the others I work with (including my own pages). After looking around for gastroparesis awareness items, I didn’t find too much that interested me. So, I created The GP Fight Store where we have a wide range of awareness items and take custom orders. One of our popular items are Gastroparesis Awareness Cards that are similar to business card size and are easy to hand out to those that want to know more about GP. Besides our goal to spread awareness, we keep our prices low so that everybody has the opportunity to purchase something. Mid-2014 I held two t-shirt fundraisers and the proceeds were given to IFFGD.org for Gast roparesis Research! Anything that I blog about will have been verified by myself with links at the bottom to support where I gathered the info. I will never post false hope or take credit for anything that is not mine. See the disclaimer at the bottom of this page. All of the graphics found in my blogs are from “Free Clip Art” websites. It is my understanding that the creator (not the location where I obtained the graphic) may or may not approve of it’s post on my blog page. If it is your graphic and you do not approve, let me know and I will certainly take it down. There are several pictures I have taken personally for my blogs (It’s Smoothie Time, Muffin Tins For Leftovers, etc) that I give permission for you to use, as long as you credit: MelissaGPfight.Wordpress.com as the image creator. I am not a doctor or nutritionist, so what I write in my blogs is based on general research and personal experience. You need to contact your doctor before you try anything that I write about. As a warning, some herbal supplements can interact in a negative manner with some medications. I am not liable for what you do. When I research a blog to write on a specific topic, I always credit the sources (via links to where I obtained the info) that inspired me with information, at the bottom of my blog. Since links change from time-to-time, I will now write out the actual name of the web site as well as provide the link and any other information I find that may benefit you (such as the date the resource was written and author name -if given). Should you find a blog that you feel contained similar information to your website, let me know and I will look into it. There is no way that I can visit every page on the internet when searching for information on a specific topic. I have seem to gravitate to a handful of web pages that I know are always accurate. May I ask how your gastroparesis started? It is my belief that it started when I had very bad whiplash from being rear-ended on the freeway one morning driving to work. I was then put on a ton of pain meds (which slows the stomach) and the whiplash was in an area that the nerve to our stomach is and had been stretched. The Drs never would agree with my theory, so I am labeled Idiopathic. I also had a ton of stress going on during that time with a company I had been working for 15+ years as they were laying off people and looking to merge with another. A bad mix for our stomachs. I did a blog on mine several years ago. It is Idiopathic (unknown). However, I feel it happened from whiplash in a car accident I was in, then was on high dose pain killers for more than a year. Compounded with tons of stress at a former job. Has your gastroparesis progressed? It seems like most people start out with gp and progress. Hi Shannon! My GP has actually gotten better over the years. I feel that it’s from finding what my trigger foods are, how much fat/fiber I can have in a meal, changing my outlook on life/health and staying active. Others depending on what caused theirs may not be so fortunate.